Boiling Point Blog: Feminist, LGBT and progressive political cartoons: Come see Cartoonists With Attitude in DC 7/7/07, or my cat will CRY! 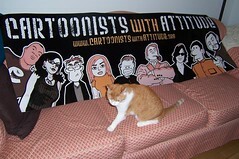 Come see Cartoonists With Attitude in DC 7/7/07, or my cat will CRY! And in case you weren't aware, you should really read our group blog (also available as an RSS feed if you want to get all our blogs and most of our cartoons in one convenient place. We also have a not-so-frequently updated Cartoonists With Attitude MySpace page if you want to be our friend.